Stateside, April 21-27 is National Volunteer week. Thanks to the collective efforts of 826,026 people scattered around the world, a heck of a lot of scientific research has occurred that otherwise would not have been undertaken. don’t know about you, but I think that’s pretty mind-boggling. Whether you make one classification or 10,000 classifications, each Zooniverse volunteer furthers the cause of getting science done. It’s nice to know that we’re all in this together. Well, I’m feeling inspired. To celebrate National Volunteer Week,I’m going to do some classifications on one of my favorite projects, Cyclone Center. Thanks again for your efforts. Keep clicking! Awesome! Since I started writing this post the number of Zooniverse volunteers has hit 826,049. It’s always a good feeling a be making a codebase open and today it’s time to push the latest version of Galaxy Zoo into the open. As I talked about in my blog post a couple of months ago, making open source code the default for Zooniverse is good for everyone involved with the project. So how do I translate Galaxy Zoo? I’m glad you asked… It turns out there’s a feature built into the code-hosting platform we’re using (called GitHub) which allows you to basically make your own copy of the Galaxy Zoo codebase. It’s called ‘forking’ and you can read much more about it here but all you need to do to contribute is fork the Galaxy Zoo code repository, add in your new translation file and (there’s a handy script that will generate a template file based on the English version), translate the English values into the new language and send the changes back up to GitHub. Once you’re happy with the new translation and you’d like us to try it out you can send us a ‘pull request’ (details here). If everything looks good then we can review the changes and pull the new translation into the main Galaxy Zoo codebase. You can see an example of a pull request from Robert Simpson that’s been merged in here. This method of translating projects is pretty new for us and so we’re still finding our way a little here. 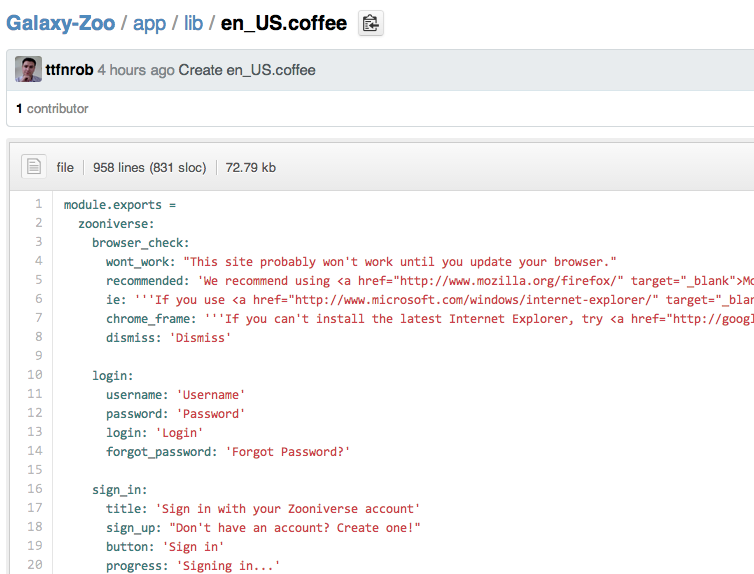 As a bunch of developers it feels great to be using the awesome collaborative toolset that the GitHub platform offers to open up code and translations to you all. At this time next week we’ll be rubbing elbows with science teachers and informal educators at the National Science Teacher Association’s annual meeting in San Antonio, Texas. This year’s conference theme is Next Generation Science: Learning, Literacy, and Living. It’s promises to be four days packed with excitement and science fun (and delicious TexMex food). Zooniverse education will be out in full force! Laura and I will be at the Zooniverse booth in the exhibition hall (Booth #1444) throughout the conference. We’re also facilitating a workshop entitled Citizen Science Investigations in the Classroom on Saturday April 13th from 12:30 – 1:30pm. 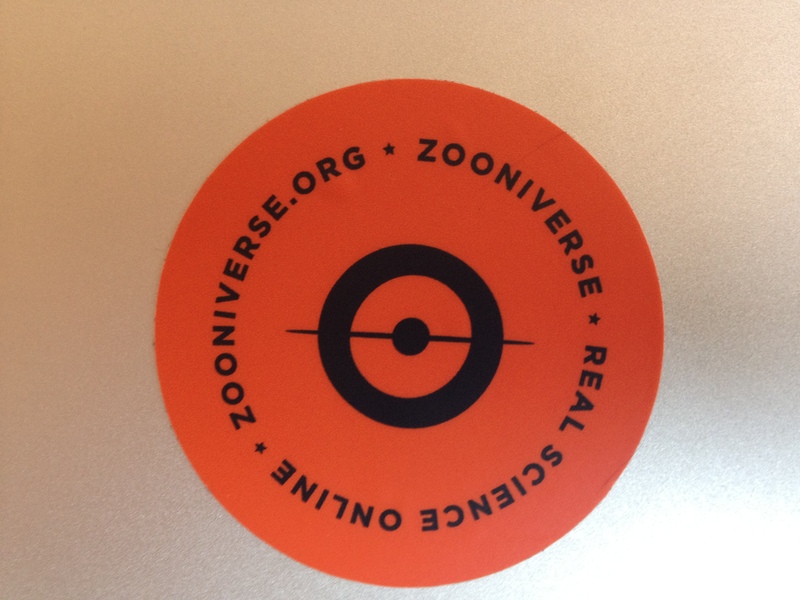 If you happen to be attending NSTA, we hope that you’ll stop by and say hello (and score one of our snazzy new Zooniverse stickers). If you’re not attending but want to follow our wacky and sciencey adventures, we’ll be tweeting (@zooteach) throughout the conference. One of these sweet stickers could be yours!